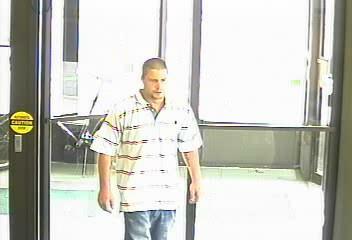 Surveillance photo taken during the TD Canada Trust robbery. Windsor Police are currently investigating two robberies that occurred on the city’s east side yesterday afternoon and early this morning. The first happened just before 5:30pm Thursday at the TD Canada Trust Bank located at 1407 Ottawa Street. Police say that a male suspect approached one of the female tellers at the counter and produced a written note and handed it to the teller. The note indicated that the suspect was in possession of a gun and demanded cash. The teller handed over a quantity of cash to the suspect, and the suspect then ran out of the front doors of the building and was last seen riding a bicycle eastbound in the alley behind the building. The suspect did not display a gun and did not say a word during the robbery. Nobody was injured during the occurrence. The second happened at 2am at the Esso Gas Station located at 824 Wyandotte Street East. Police say the clerk working told them that a lone male suspect had entered the store with his right hand in his jacket pocket, approached the clerk and told him that he had a gun and demanded all the money from the cash register. The clerk complied and handed the suspect a quantity of cash from the till. The suspect then fled the store and was last seen riding a bicycle away from the area northbound on Marentette Avenue. The clerk did not see a gun and he was not injured during the robbery. Police have identified the suspect responsible for both robberies as Joseph David Reid aged 27 years of no fixed address. He is wanted for two counts of Robbery. Investigators are requesting that anyone with any information regarding the whereabouts of Joseph Reid to call police at 519-255-6700 ext 4830 or anonymously to Crime Stoppers at 519-258-TIPS (8477). Police are advising citizens not to approach Reid if he is seen but rather to call police.